Broadcasting Mondays to Fridays, from 11pm to 1am, An Taobh Tuathail ('The Other Side') is the leading (only?) underground music show on Raidio na Gaeltachta, the Irish language service of RTE (the Republic of Ireland's equivalent to the BBC). It's an obvious and lazy comparison, then, to call presenter Cian O Ciobhan the Irish John Peel, but his laid-back manner, combined with the eclectic and astonishing mix of sounds played on the programme, make him more worthy of the mantle than any other DJ I'm aware of in Britain or elsewhere today. Many of the tracks played on any given show will come as a welcome new discovery to even the most clued-in hipster, which can also be extremely frustrating if you're a non-Irish speaker trying to identify the track in question. To some degree though, the programme's adventurous music policy was determined by necessity. Although uniquely free of the playlist restrictions of most Irish radio programmes, when An Taobh Tuathail began broadcasting in 1999, RnaG had a strict policy of not playing any English language recordings on the station. While this was obviously frustrating for the presenters, it also forced them to dig deeper in their search for material, leading to the show developing a distinctive sound that eschewed the obvious and favoured the abstract and instrumental - strands which, co-incidentally, would come to greater dominance even in English-speaking countries as the decade progressed. 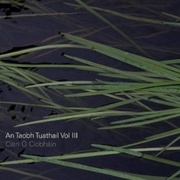 In 2005 the ban was relaxed, if only for RnaG's new youth-focussed strand Anocht FM, into which An Taobh Tuathail was incorporated, allowing them a freedom which British radio shows may take for granted but which An Taobh Tuathail saw, characteristically, as "the leeway to play absolutely any sound in the history of recorded music." The type of music played on the show evolves gradually through the week, with reflective post-rock, dream pop, ambient electronic experiments and alt-folk dominating on Monday and Tuesday, harder electro and dubstep creeping in on Wednesdays, and then much more dancefloor-oriented programmes on Thursdays and Fridays, typical of the club sets O Ciobhan can be found playing out at the weekends. This CD focuses mainly on the kind of music that one might hear earlier in the week on the show. Mostly electronic music incorporating acoustic textures, or vice versa, it flows together into a seamless whole, conjuring up a wistful ambience of still night skies and gently shifting shadows, mildly but thrillingly disconcerting. Opener 'Frozen Glass' by Galway's Loner Deluxe is typical in the way it quietly insinuates itself with rippling piano over a bed of muted strings and wind sounds, before a pair of soft, haunted torch songs, courtesy of Roshi featuring Pars Radio and Essie Jain, fully lull you into readiness for the hour of astral voyaging ahead. 'The Evening Station' by Dublin's Rollers/Sparkers pulses like the sombre call signal of some mysterious1970s longwave radio programme from behind the Iron Curtain, and the minimal Berlin beats of Miwon's 'Shinkansen,' skip and shuffle as the colours gradually shift around them. 'Walc' by the Polish composer Jacaszek is solid atmosphere, an inert gas, popping and crackling with lightning and dangerous static, and the smothered voices of those lost and swallowed up within. By comparison the quirky electro-pop of 'Triple Trouble' by Galway's B-Movie Lightning, AKA Cane 141's Mike Smalle, seems almost conventional, recalling the likes of Memory Tapes but with more of a European dancefloor groove. Factory Kids are the band of one Tim Chaplin of Warwickshire, a regular listener and correspondent to the show, who has remixed their track 'Look After Everyone' under his Luminous alias. The result is a queasy drone over a fizzing drum machine, with echo-drowned vocals and the feel of 'Soon'-era My Bloody Valentine with the guitars completely scoured away. The two acts potential listeners are most likely to be familiar with sit together towards the end of the CD. On 'False Memory Syndrome,' The Caretaker recreates a crackly 78rpm disc of the orchestra on the Titanic, holding their 50-year reunion from the rime-encrusted deck on the sea bed, while 'Loch Raven,' lifted from Animal Collective's Feels , evokes the ghostly voices of drowned surfers rising up from the wiped tapes of Smile. Suffice to say both songs are entirely at home amid the tapestry of tracks on the album, sounding neither better nor worse than the lesser-known acts alongside them. The final track is 'The Highway' by Austin's Peter and the Wolf, a regular favourite on the show since 2006 and a relatively straight-forward, strung-out ballad on piano and acoustic guitar- but a thing of fragile beauty, nevertheless. You're left with that rare thing, a compilation that stands up to repeated listens as a whole, rather than something you cherry pick for your favourite tracks. An album for late nights and contemplation, drifting alone in the darkness, its chill beauty is at once eerily timeless, yet aches with the promise of a future yet unheard.